Opening Night Film: What I Love About Concrete is the debut feature by the directing team of Katherine Dohan and Alanna Stewart and is a surreal suburban tale about a teenage girl who believes she is transforming into a swan. Closing Night Film: Usama Alshaibi will be making his triumphant return to Chicago with his latest documentary, American Arab, a personal and sociological examination of what it means to be an Arab in a post-9/11 United States. This film is partially a follow-up to Alshaibi’s earlier doc, Nice Bombs, which won the Documentary Feature award at the 2006 Chicago Underground Film Festival. Watch the trailer for American Arab here. Other Feature Films to Look Out For: Who Took Johnny is the latest documentary provocation by the team of Michael Galinsky, Suki Hawley and David Beilinson; Shadow Zombie by Jorge Torres-Torres focuses on the lives of outcasts in the American south; director Nik Fackler convinces his friends to go on a doomed African journey in Sick Birds Die Easy; Alex Ross Perry tries his best not to exploit the Yucatán in Mark Peranson and Raya Martin’s La última película. Short Films of Note: Jodie Mack‘s electric Let Your Light Shine; Mike Olenick‘s nightmarish Red Luck; Tony Lawrence’s NeonSpread; Kent Lambert‘s remixed Reckoning 3; Skizz Cyzyk‘s poppy Alfred Jarry & ‘Pataphysics; Lori Felker‘s Scattered in the Wind; and the latest film by Mike Kuchar, Happy Birthday. 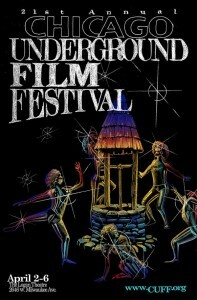 The full 21st annual Chicago Underground Film Festival lineup is below. For more info, please visit their official website. 8:00 p.m.: What I Love About Concrete, dir. Katherine Dohan, Alanna Stewart. A teenage girl wakes up one morning to discover that she is slowly transforming into a swan, among other unusual developments. 6:30 p.m.: Sick Birds Die Easy, dir. Nik Fackler. Director Fackler leads a team into the African jungle to find a controversial plant that is said to cure opiate addiction. The trip does not go well. Curator Ernest J Ramon has collected a host of strange and controversial conspiracy videos from YouTube. 9:00 p.m.: When My Sorrow Died: The Legend of Armen Ra & The Theremin, dir. Robert Nazar Arjoyan. This documentary profiles Armen Ra, whose life was completely transformed after discovering the Theremin. 6:30 p.m.: a l’est de l’enfer (East of Hell), dir. Matthieu Canaguier. This documentary explores the underground music scene of Black Metal in Indonesia. Psychic TV: Dreams Less Sweet, prod. Sam Zimmerman, Edward O’Dowd, Genesis P-Orridge. This collaborative film combines the work of 47 artists and the music of the band Psychic TV’s second album. 8:30 p.m.: Dream Town, dir. Adrian Briscoe. Director Briscoe visited a remote Russian coal-mining village on a Norwegian island and invited the residents to make short videos. 7:00 p.m.: La última película, dir. Mark Peranson & Raya Martin. A pretentious American filmmaker (Alex Ross Perry) tours the Yucatán with the help of a local native in the hopes of ultimately making a movie about the end of the world. 10:00 p.m.: Shadow Zombie, dir. Jorge Torres-Torres. A pot dealer living in a small American town paints himself up as a zombie doppelganger and falls in love with a girl who likes to dress up like a clown. 6:00 p.m.: Who Took Johnny, dir. Michael Galinsky, Suki Hawley and David Beilinson. This documentary examines the unsolved case of Johnny Gosch, who mysteriously disappeared while delivering papers on the morning of September 5, 1982.